Our professional trainers take this into account when coming up with an individual training program for your dog. 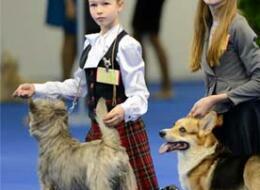 We would like to offer you an option for the consideration - this is the club "the dog trainer". 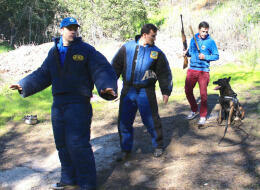 Master Dog Training professionals train dogs for all kinds of search and detection services. 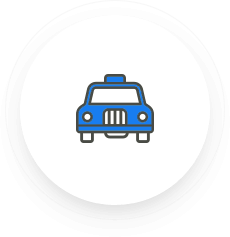 Our customers tell us "Thank You"! 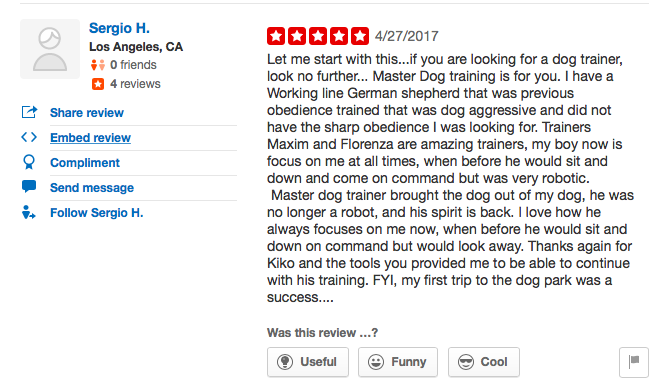 Let me start with this… if you are looking for dog trainer, look no further… Master Dog training is for you. Maksim is a very knowledgeable dog trainer. He’s serious, and he takes the well-being of our dog seriously. After completing the obedience dog training course, the dog becomes well-behaved, and always listens to the owner when given a command. In the agility dog training classes, the dog plays, experiences joy, and the owner has a good time with his/her dog in a sporty environment. In the fitness for dogs course, the dog swims, does different exercises that work every muscle in its body, learns to go through the agility course, and runs along with a bicycle. This is for the dog to properly exert all of its energy and to be healthy. Tracking through sniffing work, a dog finds a person, a hidden or lost item, or picks out the owner’s object out of 12 other objects. Sniffing is a necessity for all dogs, regardless of breed. 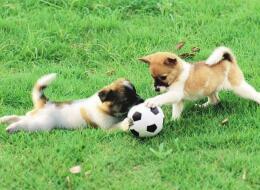 We also offer Puppy Obedience Training for puppies 2 months old and older. 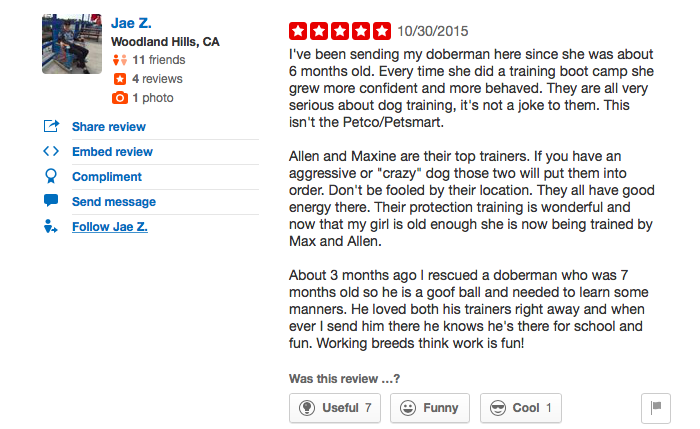 In Los Angeles, it is quiet hard to find a dog trainer that is willing to train aggressive dogs. Firstly, there are not enough trainers with the knowledge to do so, besides the trainer is taking a big risk to train this kind of dogs. However, Master Dog Training is different. 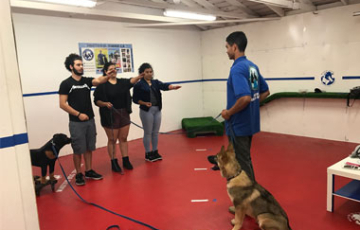 We provide aggressive dog training that helps improve dog’s behavior, teaches their owners understand the reason for such dog’s demeanor and teaches how to correct it. 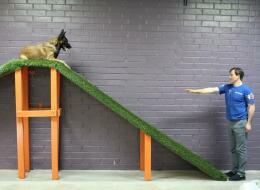 Schutzhund is a protection sport that is safe and teaches protection to a dog through play. The dog learns how to release their inner hunter, and in this game of protecting their owner, practices protection and hunting that is necessary for them and gives them and the owner joy. 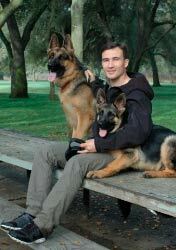 Schutzhund dog training course fulfills and makes the dog happy. The next level in training the dog is to perform family protection. This teaches the dog to protect any items left by the owners, the car, the child, and the territory in which the entire family lives. Although dogs learn protection, they remain friendly. Kanis-therapy helps adults and children, includes work with a specially chosen dog through a program that was developed by experts in dog training, psychology, physiology and behaviorism. The program produces noticeable results, as the participant experiences great joy from working with the dog. The participant also learns how to perform certain tasks with the dog such as walking, playing, cleaning, and traveling. 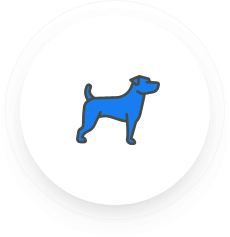 The dog and its owner will participate in different games, which will teach the participant to control their dog with over 15 different obedience commands. 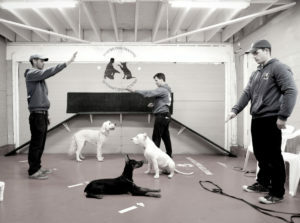 Our dog trainers are fully certified and have received several nation and world-wide awards in dog training. Specialists receive theory and practice and have the opportunity to practice, not just in America, but in Europe as well. This education will aid them for the rest of their lives and careers. 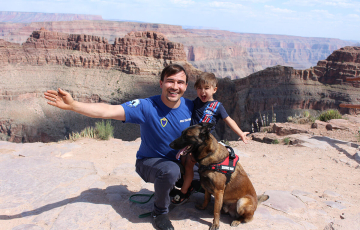 We offer courses for service dogs that can work with children and disabled people, as well as police and security dogs, instruct Shutzhund, owner protection and agility. All of these programs can be taught online, or in person and the pace will be based on the individual. 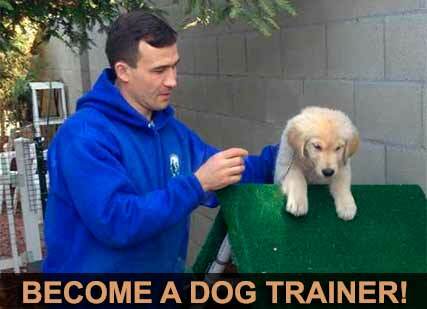 BECOME A DOG TRAINER! 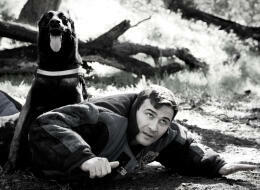 JOIN OUR DOG TRAINER COURSES! 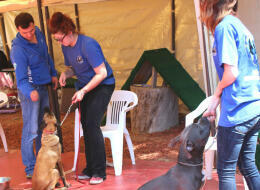 Become a Professional Dog Trainer today! Have you always felt you had a special connection with dogs? Are you interested in starting your own dog training business or work as a dog trainer to help dogs and their owners? 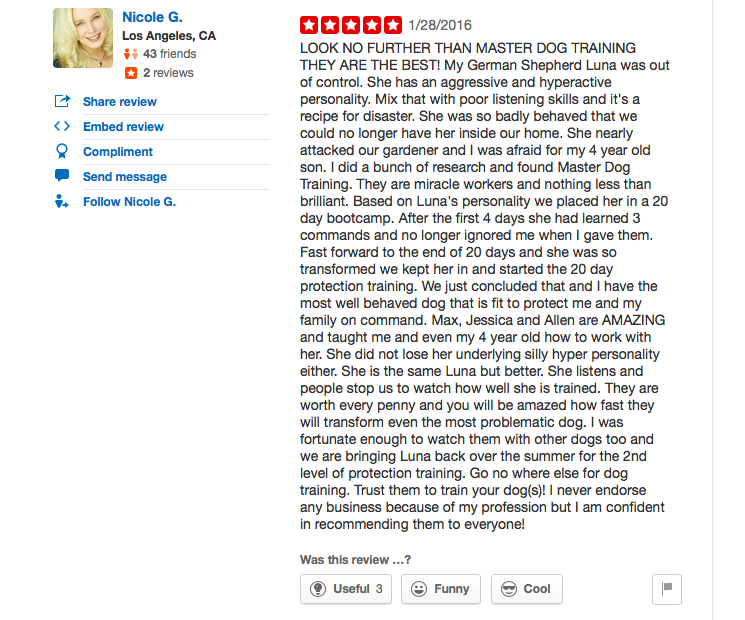 If so, we encourage you to enroll in Master Dog Trainer Courses for aspiring dog trainers. 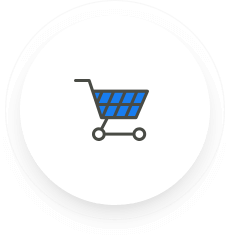 We offer a variety of programs that fit every budget! Join our Dog Trainer School online and become a certified dog trainer at your own pace. CLICK HERE TO JOIN OUR ONLINE DOG TRAINER SCHOOL NOW! 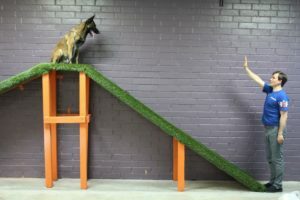 Master Dog Training offers many services, including a dog hotel which includes one acre of lush green property, an agility obstacle course, indoor facilities for massages and training, as well as specialized Schutzhund equipment. 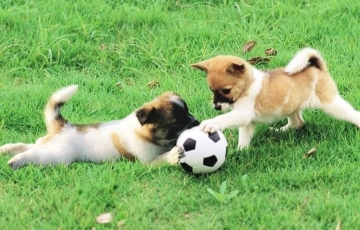 From small puppies to full grown dogs, we train them all. 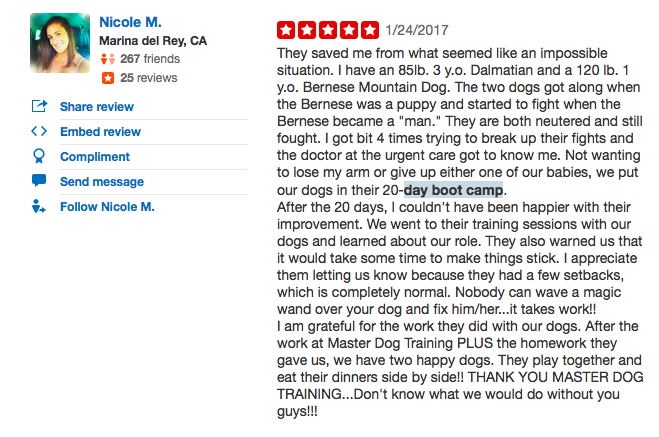 Not sure what kind of training your dog needs? 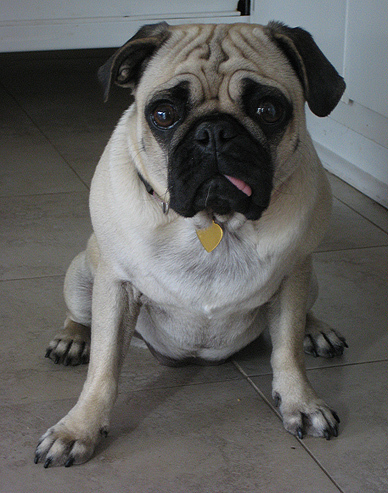 Our specialists will help you come up with a program specifically customized for your dog’s age, breed and temperament. Dog massage is used after an active walk (different games, running, swimming, and the obstacle course). The dog is massaged by a qualified specialist that fully understands dog physiology and anatomy. 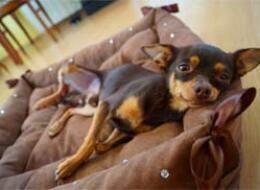 The massage relaxes and helps improve the health of your dog. The massage takes place in a special facility located at our school. Gift certificates will delight your family and friends. The recipient will experience the excitement of being at our facility with the dogs, and will get a personal lesson. For those that love being active and/or are adrenaline-junkies, they will find joy in working with dogs on a professional level and we will help them learn new skills and tricks to use with their dogs. Service dog training- the important dog training for the owner who needs the dog’s help. 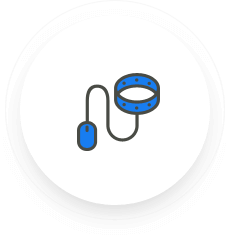 Since the wishes of the owners and especially the symptoms of their health and physical disabilities are very different, so the Service dog training is divided into four stages. If your dog doesn’t know how to behave and obey, this causes a whole lot of problems both for the owner and for people around you. Naughty dogs cause people to dislike dogs in general. We notice that in the media and on the streets as well. Education and training are concepts tightly bound together, which makes no use if you try to divide them. A family dog is a favorite pet and every family member has their own bond with the pup. The relationship is built over time, with shared experiences like living together, playing, and just being around each other.